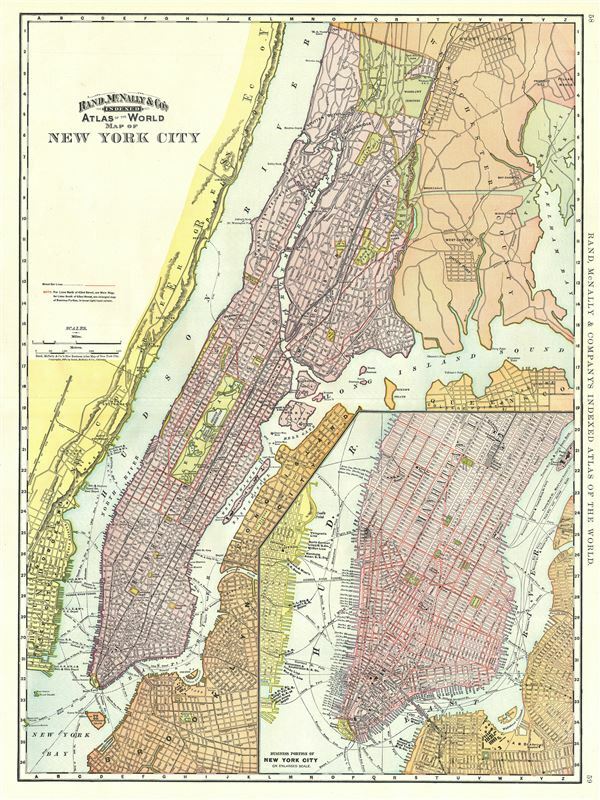 An uncommon 1892 Rand McNally and Company map or plan of New York City. It covers all of Manhattan and the Bronx as well as parts of Brooklyn, Queens, New Jersey and Westchester. An inset in the lower right quadrant focuses on the business portion of New York City in the southern half of Manhattan below 60th street. The map includes further notations regarding important buildings, major and minor streets, street car lines, ferry lines, parks, etc. This map was issued as plate nos. 58 and 59 in the 1893 edition of Rand McNally and Company's Indexed Atlas of the World- possibly the finest atlas Rand McNally ever issued. Rumsey 3565.074 (1897 edition). Philips (atlases) 1026 (1898 edition).